On September 12, 2015, the El Paso AAA Baseball Team's season ended with a 7-4 loss to Fresno. With two wins already, the Fresno Grizzlies had topped the El Paso (Team) to play in the playoffs against the Round Rock Express, with the winner of that taking the Pacific Coast League Championship and playing in the Championship Game against the International League. As a side note, I hope Round Rock wins, because since the Championship Game is being played in El Paso, Fresno would face a particularly hostile crowd. 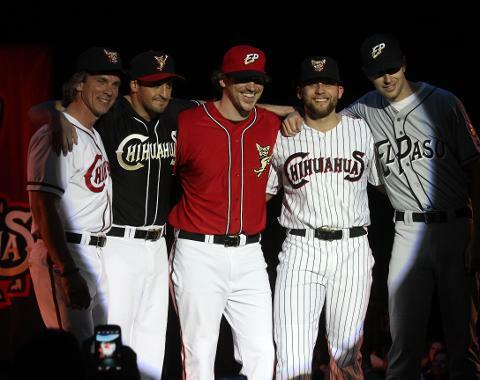 As many of you know, I have an intense dislike of the name of the El Paso AAA Baseball Team. It's so intense I refuse to say it or even write it. Two years after the name was announced, I'm still displeased with it to that level. When it was first announced I was so aghast I signed a petition to have the name changed. I vowed not to buy anything with the team name on it and was hostile to the whole thing. If I hadn't already bought my season tickets prior to the name's announcement, I probably would have boycotted the games altogether. I know some people who have indeed done that and have yet to go because of the name. However, I'm glad and proud to be a full-season ticket holder, for I have grown to love the game and the team. The Name...well, no. Still, this team has been a wonderful thing for The EP, and the haters have been proven wrong again and again. I was never a hater, oh, maybe of the name, but not the team. Not by a long shot. My best friend Gabe has kept track of the number of times I've said The Name. He says that four times I've slipped and referred to them as the El Paso (Name). I get an exemption from this when referring to their Twitter handle since I can't say @epbaseballteam, but @epchihuahuas. As of today, I'm proud to say that I still haven't bought ANYTHING with the name. Well, there was a travelling mug, but that couldn't be helped. All my gear has either the Ball & Bones or the EP logo on it. I have so many caps that my mother is hopelessly irritated with the number. However, now that we're two years in I must confess something. I still don't like The Name. I still won't wear anything with The Name on it. However, I have grown fond of the mascot, Chico, and even weakened on the idea of having something with the dog on it. Chico is a trip: fun, outrageous, and a perfect mascot. He is frisky, he works great with crowds, and has a joie de vivre that can't be beat. My one great regret is that in two years, I have never been able to have my picture taken with Chico. I wish I could say that I had a firm, logical reason for liking Chico. I don't. I think it's just part of a good time at the baseball games, and that I have, in spades. I complement the Baseball Team crew, from the front office and my account manager who has been nothing but helpful whenever I ask a question, to the ushers, the security, the EMT, the shop staff (who really should know me by now), and the concession stand workers. I think it's clear that everyone there has been really top-notch in how they work with the public. I think the vast majority of the people at Southwest University Park enjoy working there, enjoy being with people, and I have never had a problem whenever I go. I've seen the EMT and ushers rush whenever a foul ball crashes onto someone, sometimes seriously. I've joked with the security people. I've joked with Andy Imfeld, the on-field announcer (not surprising since he has to pass my seat to get to the field). I've enjoyed many of the promotions and themes of individual games, and find the Dizzy Bat Race a great highlight. One thing, on a serious level, that I have to compliment the El Paso Baseball Team/Organization on, is on how much they do with/for the community. Chico has been to my library at least twice, and there probably isn't a day that goes by where Chico or the El Paso Baseball Team/Organization doesn't do something community-related. They go to schools, offer SUP for 'sleepovers', host both Faith & Family and Gay Pride nights. I have to compliment and salute all the work the El Paso Baseball Team/Organization has done to be full-fledged members of The EP. I think few organizations have worked as hard as they have to win the hearts and minds of their community, and to be an integral part of it. They have succeeded beyond any measure. The games have been thrilling. Gabe calls them "the Comeback Canines", and many times it looks like the team is down but finds their second wind to rally to victory. The fact that the first-round playoffs went to four rather than a sweep is a credit to the team's furious efforts to make a comeback (and yes, you CAN call it a comeback). The players themselves have all been extremely approachable, pleasant, and good guys. I've never heard anything bad about any of them, and I always end up saying "He's a real nice guy". OK, there was that incident with Cody Decker, where he trashed Gone With the Wind and didn't take too kindly to me saying he was wrong. I stand by my views: he's wrong, period. However, apart from his lousy taste in movies I have nothing but praise for him. I'd name a child after him, should I have one (and should my wife let me). He, after eight years, finally gets to play for the San Diego Padres, and while there's no knowing if and/or when he may return, I wish him all the best. But he's still wrong about Gone With the Wind. All the other players I've met (Ramiro Pena, Rocky Gale, Jake Goebberts, Chris Rearick, Rymer Liriano, among others), have been wonderful with the fans. Yes, I have autographed cards from all of the ones named above, and even Decker. Hey, he might be wrong, but he is good at what he does. I even got a jersey, though perhaps one could question why I got Imfeld's jersey. Let's just say when it comes to bidding, I get competitive really fast. I don't know where any of them will end up in their careers, though I wish all of them the best. For me though, they've earned a place here in The EP as people to know and respect. Especially Liriano, who has the most unique walk-up song in baseball. Just the first three vocal notes and the stadium gets excited. I know, the name thing is still something I struggle with. I won't change my view on that. However, I am warming up to the dog. Last year, I bought the El Paso jersey because it says "El Paso", and not The Name. This year, I've been hinting relentlessly to Gabe about the red one: how it will make a great Christmas/birthday gift, with my name on it. And NO...I don't want sparkly letters with it. Just don't expect me to wear one with The Name on it. There may be some bridges too far to cross.